It all begins in a remote village, where a young man called Shawn travels together with his friends to the Temple of the Clouds. There, Shawn gets into contact with you(!) - a guardian spirit. A bodyless entity from ancient tales... that talks in his head! You directly interact with him through the 4th wall as your own character in the game's world. Your relationship to him and the other characters will shape the events unfolding. I've been working on Numina for quite some time now. In the beginning it was a German-only release, but I wanted to present the project to a broader audience, which is why this demo also ships with an English localization. I currently don't have a set release date for the full game, because I'm still working on it. But I'm very excited about this first international release and I can't wait to hear your feedback! Hello starlit, if your not busy I would you to join a private project working for free as a GFX artist or even a coder. Hey there! Thank you for the offer but I can't take on any additional work right now. Hi! I haven't finished the demo yet, but I HAD to pause the game for just long enough to get my thoughts down to you. Right off the bat, as I played the intro, I was thinking 'oh, good graphics' - and I've been holding onto that opinion solidly so far. The graphics and the mapping are gorgeous - I really love how dedicated you are to conveying a setting's specific vibe or feel, with all the extra efforts put into making it more realistic. Your visions, I feel, really translated well in-game, especially with regards to the Temple in general. The stained glass behind the altar and the signs of ruin really resonated. There are a few lines of German dialogue that I feel slipped through, but they're not at all detractive, considering that this is still only a demo. I really like the fact that we as the spirit have the ability to choose our personality in a sense, and am eager to see what the consequences of us influencing Shawn are. I would have liked to see a they/them option for the spirit, actually. I'm also not sure if this is a bug or if it's just my game, but after the Temple explodes and you go back up to find Aura, there's a section where you can climb up a cliff using the grappling hook; one of the animals there seems to be stuck with a tree, blocking the path to the little glowy thing (and I should say I really love the glowy thing. It's like a beacon, and saves a lot of trouble searching). There's also a little bit of lagging in the fights after Sarah joins, but I can't say if that's just my laptop. I'm not too far into the game yet, but I hope I shall be able to come back and give you more thoughts once I've finished the demo. EDIT: The demo has been beat, lmao. Spoilers for any new readers, but GOD, do I really, really want Raphael to survive. He's grown on me very much over time despite being a simpler character than most of the cast we've seen so far. Something about those big buff do gooders with their hearts of gold, you know? I'm also rather interested in whether that last kid - the one that joins your fight against Aziel, whose name I seem to have forgotten despite reading it a solid ten minutes ago - is going to join the party for real, but that's neither here nor there. I do think that in the game to come, I hope that our interactions with Shawn can be measured in a counter of sorts - it would make it a little easier to keep track of any spirit-related skill upgrades, or just gauge the relationship you have with him at any point in time. It would also be nice to have a counter to track Shawn's relationships with each party member, even if it's not necessarily romantic - I feel like his friendship with Raphael could be explored beautifully, haha. I'm a bit of a friendship buff when it comes to adventuring parties. Also another obligatory love letter to the GRAPHICS... so gorgeous and so so so contributive to the atmosphere. The love and effort you put into the game is really fantastically visible. Thank you so much. I really can't wait for the full release. Hey there! Wow, thank you very much for taking your time to leave a comment on here :) Really appeciate it! I'm happy that you resonate with Raphael, he was the last character for the main cast I came up with and it was clear from the beginning that he'll have to play some central role in driving the story. But it was a long journey to this iteration. The bonds between the party members is a bigger focus for the upcoming chapter! If you liked this one, you'll love what's to come :) I also already added a sort of "Heart"-meter like you mentioned to get a rough feel on how your companions feel about Shawn. Thanks again for sharing your thoughts! I hope you stick around for the next release! Thank you so much for taking the time to leave a comment :) Happy you enjoyed the demo! There are definitely planned romance options which will weigh in more in the 2nd chapter but I actually never thought about the player character/guardian spirit being an option. It's a really interesting but somewhat abstract idea - falling in love with someone who's appearance you don't really see but is part of your mind. What I can share with you are the already mentioned upcoming romance options! :) There will be some scenes & situations you'll definitely enjoy, I'm sure! Thank you for your feedback! I never imagined people would get some German-exercise out of Numina, even unwillingly :D I do hope the bugs weren't too distractive tho! Thank you very much for your comment! I finally finished the demo and I am so excited for the entire game to come out! I have so many questions that need to be answered and there are still some quests that we need to complete! The plot, music, combat, and characters are amazing and I was so drawn into the world. This truly was an excellent game! Amazing job! i was hooked...and now...i'm left hanging... with one tiny finger barely holding onto life! the gameplay is nice ! hopping for more "variations" in the future tho, since only raph and cassandra have a different one so far, raph's being a bit easy. over all, very enjoyable...looking forward for the full game...i really am...a lot....JUST GIVE IT TO ME ALREADY !!!! I WON'T BE ABLE TO HOLD ON THAT CLIFF FOR TOO LONG!!!!!! Hey there! I'm very sorry for the inconvenience. There's one other thing we could try: With the font installed, open the game's directory. Instead of clicking on the Launcher.exe, navigate to the bin-directory and open the Game.exe. Hopefully, this will start the game for you. I'm very sorry. 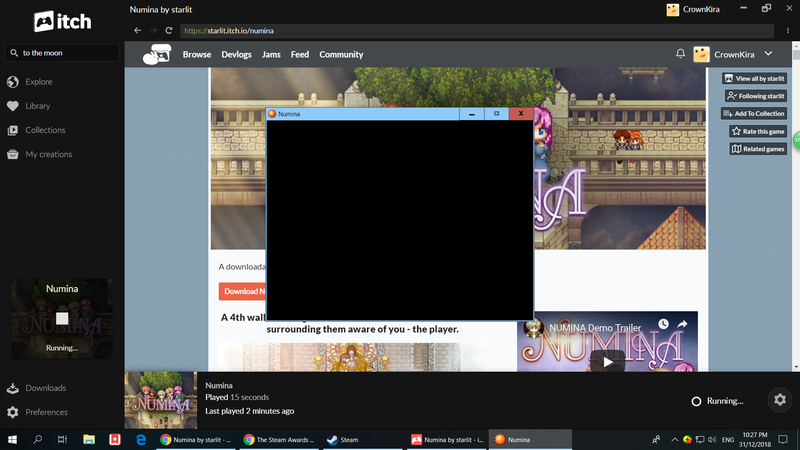 There are some issues with RPG Maker XP on Windows 10, which is also why the next release uses the MV iteration of RPG Maker. Until then it's very hard to determine the exact issue of this. Again, I'm sorry for the inconvenience and hope you stick around for the upcoming release, slated to come out this summer. I'm getting closer and closer to the end and I'm so worried for everybody! I love your characters so much, which shows just how good you are at writing them. I have been absolutely amazed by this entire game! Great job! By any chance, Can the player save Musame from dying? But no, sadly you can't change the course of his fate. Sorry, I didn't even think about that. Things are getting really serious! It took me so long to sneak past the rebels, but it was so rewarding when I finally got past them. I think I'm getting closer to the end, so I look forward to what else is in store! Great job! Hey! Sorry about that! Could you post a screen of said message? I'm not sure where exactly you are. But once you've entered Aluyin, you need to go to Shawn's place first (north-east of the map), then find Raphael at the statue outside, next go to the assembly hall (north-west) and back to Shawn's home. This game is getting more intense! With each new character introduction I fall in love with this game even more! Everything is so well done! Great job! Also made a video for the first part of the game i recorded and read most of the text outloud will upload soon maybe. Actually... There was a bug so I was stuck. I could turn left right or up but I just returned to where I came from so... Yeah I'm not stuck anymore !!! And I saw the end !!! IT WAS SO AMAZING IT MAKES ME SHIVERS !!!!!! I love it pls continue your good work. I'm definitely working on more, so please stick around for the next release! Escaping the guards--- the first two you see the one on the left is your big problem. Looks back twice within a short time the a somewhat long pause walk past him go to the well below and then the wall go one tile infront the wall and go down until you cant anymore. then start walking right under the trees if you think u got stuck or not moving go up one tile and continue moving right after that you will be free. Hello Players and the Owner/Company of the game. Even though it was hard and i encountered more enemies it seemed to easy..
i was kinda sad about not having more to it. i completed the game within a 2 hours and 30 mins =). I wish i could join the team and help you's on the storyline. Thank you for your lengthy answer. And let me just say - a speedrun would be so cool :D I'm sure you'll find plenty of loopholes. Let me know if you'll upload anything to YT or alike! Also im kinda confused there was a sword disappearing and reappearing on the bottom right of one of the levels with fog i went to it an interacted with it it did nothing expect for go down. It took me a while to complete this part of the demo but I finally managed it! Once you realize what you have to do everything becomes clear. Good job! I'm having an issue with the ice cave guardian thing in the caves where we rescued Raph. It just keeps on hardening and using powder to heal itself. Is there something I'm missing? Hey, Starlit. You've made an awesome game, but i need help with something. I don't find any gameplay that is in the level that i am. Ignoring this, the quality of the textures, particles, effects, camera movements, are just... amazing. I would really appreciate if you help me with this part xd. Wow thank you so much for the praise! :) I'm working hard on even improving the game for the upcoming chapter. Hey there! Thank you so much for the feedback :) I see what I can do about an introduction to the controls! Another episode down! In this one I really got into the morality of the game, as I had to start making choices that would shape how characters interacted with each other. I look forward to delving deeper into that! Good job! I'm having a problem with the game it won't let me delete it off my computer. It's saying the file is still open, So I deleted every file until it got down to the 'Font' file, now I can't get it off my computer as many time as I have tried. Can you help me? Sorry for the inconvenience! Have you tried restarting your system and then deleting the file? What version of Windows are you running? I'm on windows 10, Also thank you that worked! I wanted to say I did enjoy the game but it wasn't my thing. I hope you keep working on this for others to enjoy! Hi! I would like to know if a version for Mac will be release? Because i really think i would love the game, Thanks! I liked that there was down time for the characters to reflect and prepare instead of just throwing them into the next quest.! It really shows that you like developing and advancing your characters' growth! Good job! Thanks for sharing! I really enjoy watching your LPs, hearing you voice the characters and sharing your thoughts on what's happening :) Also happy that you enjoyed the character scenes! Can't wait for the next episode! Hey, thanks for taking the time and leave a comment! :) Really appreciate that you liked that aspect of the game. I'm really enjoying the combat style so far. I like how you change it for each character. It keeps the combat from seeming repetitive. Good job! I think I'll focus on getting out on PC first xD Thanks! I'm loving this game so far! I finally reached the mechanic where you are actually in the game and it was really well implemented. I can't wait to play more! This was the first game i've played where it breaks a fourth wall which is so COOL ahhhh--i've actually been wanting to play a game like this. I look forward to the next chapter-- keep going strong starlit !!!! Thank you so much! :) Happy you enjoyed bending the 4th wall :) I think it is one of the more unique characteristics of the game, so I'm happy you enjoyed that part.